Prompt No 2. First memories of wash day. Was it a ritual in your house. Did you have to play a part. What kind of washing machine did you have? Was it the sole province of the women of the household? What was the style of your clothes line? Any memories of doing the laundry you care to share. I am sure that we are going to find some differences both geographically and generational with this one. Help me prove myself right or show that I am wrong by joining in. Of course, we are talking a classic baby boomer upbringing: so cleaning was mum’s role Only mum wasn’t great at conforming to stereotypes. First you have to understand my mother was not typical of her time. She had no truck with routine, believed tomorrow too far away to worry about and yesterday too far gone to matter. She had an ambivalent relationship with cleaning, seeing it as an unnecessary constraint on getting the most out of life. Food was essential, and healthy eating necessary – so clean food preparation areas important – but cottons on a carpet? The created a new pattern. Mud on boots? They were nature’s dubbin. Dust – a food stuff for microbes, spiders were nature’s fly controllers and so on. So washing happened. She understood expectations – school shirts and shoes had to be within the limits of whatever arbitrary code was imposed; offices had their own uniform requirements. Mum was no rebel but she was a semi professional subversive – shirt fronts and collars might be ironed but the back and sleeves ignored. Sink or strawberry barrel? No contest really. As I go back to mum’s cluttered and curious kitchen I recall a large zinc pan with handkerchiefs boiling away – the smell was appalling. That is an early wash day memory. A nasal scarring. She also had a wooden contraption that hung from the kitchen ceiling which dried and aired the clothes if drying outside on her washing line wasn’t possible. One day in a steamy noise-filled kitchen the rope tieing the airer to the ceiling gave way with a stupendous crash. In the ensuing chaos my mother was in hysterics. Not from fright or anger but laughter as the dog tried to sprint one way and little me went the other, both of us desperate to find, and failing to find, some grip on the shiny skiddy Lino. Her outside line was somewhat Heath Robinson, with a clothes prop helping ensure the linen didn’t drag on the ground. It was strung across the garden at a height that would catch Dad on his evening wander to check his vegetables. Amateur dramatics or airing the laundry? Seriously? For years mum swore she didn’t need or want a washing machine, doing everything in the sink or the awful boil wash on the stove or, in the case of the sheets, in the bath? If dad suggested an outlay for a machine, mum would list other things she would need- a new sewing machine, a set of trowels, a workmate. I guess the first machine appeared sometime in the 1980s after I’d left home and dad must have caught her at a weak moment. This entry was posted in miscellany and tagged cleaning, memories, mum, washday. Bookmark the permalink. I think your mother and my mother must have been twins! She also did only what was necessary, probably around the same time as your mother as we are near in age, and spent her time out at work or doing other things she considered more important than dusting. We had the wooden pulley and the clothesline with the stick propping it up and one day I did indeed run into it when there were no clothes on it and came a cropper. I really thought I was dead as I lay on the grass looking up at the blue sky! My sister and I used to attach our dolls to the pulley and give them rides up and down. She was, however, quick to buy a washing machine – a thing called a Keymatic with a red square ‘key’ a bit like a 3.5 floppy disk except thicker, imprinted with white writing which denoted the programmes. It went on for years but finally packed up in the 1990s with some of my father’s undies in it which, when we did eventually get them out, we had to bin because they had gone dark grey and stretched to unbelievable proportions. Hubby couldn’t stop laughing! My aunt was much the same but now she’s in her 80s she’s a fanatical washer and cleaner as she can’t bear to think that if she had a fall and people had to come in, they’d think she was a mad/sad old woman who was senile if things didn’t look spot-on. All change. 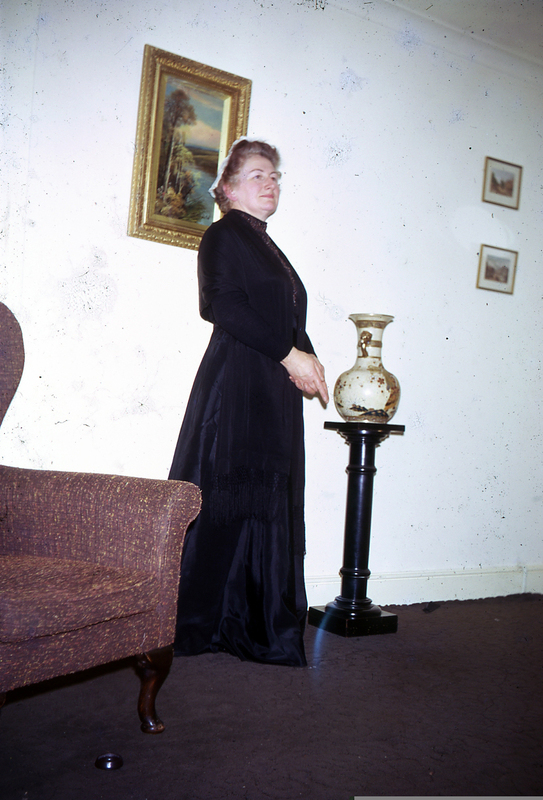 Your mum looks fab in her Hedda Gabler-type outfit! I recall a kenwood explosion that covered the kitchen in mayonnaise when her mixer decided to deconstruct itself one day. She was most upset at the wasted ingredients. It’s good to know she wasn’t alone though she did appear to be in deepest darkest Hampshire. So many times I have included Mum’s ‘Wash Days’ in my books: the top loader, the rubber mangles, the suds, the steam, the clothes horse, the clothes airer – always easier to let down than pull up to the ceiling with the damp clothes on it. The hiss and thump of the iron… There were always rows in our house on those days because Dad didn’t get a ‘proper meal’.Makes me miserable just thinking of Wash Days! I love my automatic!! Irene will be delighted if you join in the memories Ellen. Looking forward to them and glad you enjoyed mine. My Mum was much the same. “Today” was all that really mattered. I would imagine that going through a war, and living in a prime industrial area (= prime bombing target), would have given her that perspective. How can we get people to adopt something similar, but without going through the destruction and carnage of a war? Now that’s a challenge, Colin. 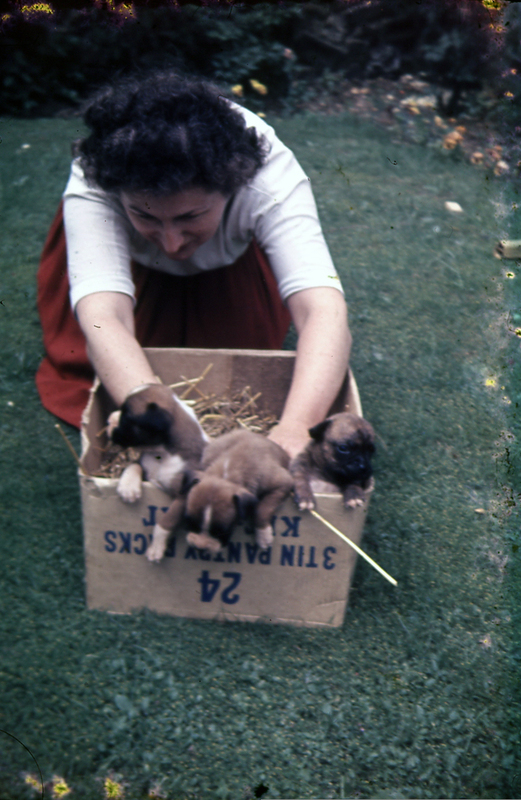 Yes I expect there’s somethign there, though mum’s contempories seemed to be universally house proud and they had been through the ‘show’. Perhaps because she had been in London during the war and a lot of them lived their lives in rural Hampshire where we ended up explains the difference in approach. I still use a pulley in my kitchen for drying clothes when they can’t be hung outside. This winter with the weeks of endless rain it’s been a blessing – though I have to remember to take washing off the pulley before I start cooking. Last night I forgot and all the clothes were permeated with the aroma of Thai chicken curry. Now that is a splendid image – I managed to leave my son’s first school shirt the colour of turmeric due to a missed duster that went in with it some years back. However I failed to add the scent… Thank you for joining in! Mum must have had a bad mangle experience because she refused one. She also had a grip like a boa constrictor with hypertension issues so wringing out bed linen was a doodle. Strong women in those days we never ever had a wahing machine!! Mum did have navies forearms as dad like to point out. Hehehe!! I meant she didn’t thump him for pointing this out?? Your mom sounds lovely. My mom was a clean freak for most of my growing up–vacuumed several times a day–and did laundry in the basement (we eventually got a washer and dryer) in the wee hours of the night. Mum dreaded certain relatives coming for the implied criticisms that would flow. She was to polite to speak out at their back biting but she was known to give the odd aunt a surreptitious churchillian two fingers if she thought they weren’t looking! Why thank you kindly. Glad you enjoyed it. I enjoyed reading that. I don’t remember those ceiling contraption things. 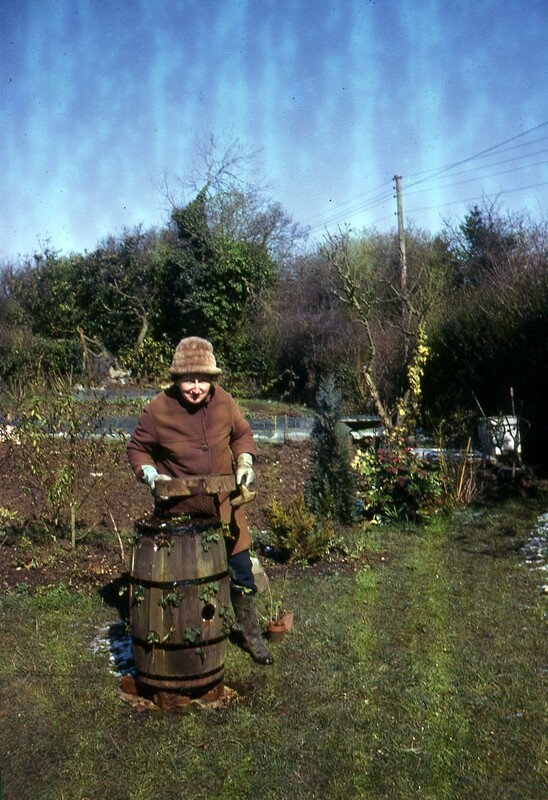 I remember early on my mum had a twin tub, with giant wooden tongs to pick up the washing from the soapy side and slop it into the spinner bit that was pretty terrifying! She had a knack of finding a few like minded souls who were great support for each other. What wonderful memories you have Geoff – always entertaining! Glad you liked it Pauline! Small girl: Mummy, are you using the washing sheen? Mother: Don’t say sheen, say ma-chine. Small girl: But Mummy, it’s not ma sheen. It’s YOUR sheen! Not sure if I can count this as an actual memory – Mum still has the women’s magazine that paid ten shillings for her letter telling this true story c 1960. Its lovely. I love how children’s logic is flawless. I used to start my weekly stories at primary school. ‘The smorning.’ I remember being upset when people said I was wrong and it should be This morning. I have to agree with her … on everything except for the washing machine. Who would rather wash by hand? I know. She had her ideas. Money was scarce so she wanted other things. What a great memory of a mom who knew what was important to her. ☺ I remember the battle my parents had getting Grandma to get rid of her old wringer washer. She was certain, our clothes would never be as clean again with that new-fangled automatic. She might have been right. My gran had some awful contraption that regularly disgorged grey water onto the kitchen floor. I think that put mum off for quite a while. I love your Mum Geoff.She had her priorities right except for the washing machine. That would have to be a must for me although I still agitate to buy a twin tub like the one Judy described. I thought it was the best machine as it washed well and being labour intensive it couldn’t be left and forgotten leaving the clothes to go mouldy. Roger refuses despite not being the one to wash. Thank you for joining in again and showing that there is a big difference between countries when it comes to drying the clothes. I haven’t seen a kitchen contraption such as you described. Our warm Australian weather meant the washing was usually hung outdoors. Large verandahs or high set houses generally meant there was somewhere outdoors but undercover where washing could be hung on wet days. Often sun showers would suddenly occur and there’d be a mad dash to get the washing in before it got too wet. Often the shower was over before the washing was even partly retrieved. I love the story of the your mum in hysterics and you and the dog scattering in opposite directions. Hilarious! Great post. It’s funny how laundry is something that so many people write about. I’ve done posts on it, too. My mom worked outside the home from the time I was small, so she was not the stereotype 1950s-1960s American wife and mother. We always had a washing machine and dryer, but no schedule for washing days. Perhaps there was a special day when I was young when sheets were washed, but I don’t remember. When my mom was a new mother (with my older brother) in the 1940s, she had to wash her clothes at a laundromat, then bring the wet clothes and baby home, bring everything up to the apartment in Philadelphia, and hang it out on the line with one of those pulleys that I’ve only seen in movies. I remember my mother boiling the soiled nappies of my baby sister. What I can’t remember is if she used the saucepan for just that Now you’ve got me worried! I dread to think about it. Certainly put me off chutney now. Thanks for this delightful post. That prompt really inspired you. Hugs. Yes, it turned up trumps: well done Irene! Your mother was a star! She was quite an influence! Starched knickers? Isn’t that child abuse? Soft starch? Isn’t that an oxymoron ? Oh yes, I think it is…but there is a spray of soft starch, I’m sure of it… !! Your Mum had the right idea — clean kitchen, the rest can be avoided! She must have enjoyed doing laundry by hand. Great memory! Reading through the comments, I’m thinking American responses are going to be much different in regards to early adoption of machines!